Women speak truth to power in the riveting legal drama Saint Judy (2018). 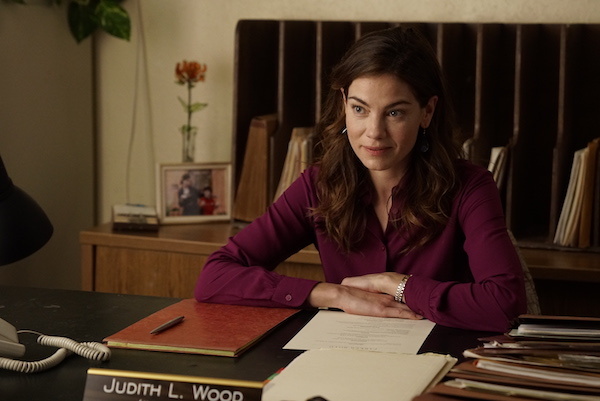 Writer Dmitry Portnoy based his screenplay on the timely story of Judy Wood, an immigration attorney who faced off against the government and changed history. Directed by Sean Hamish [Return to Zero (2014)], the film begins with idealistic public defender Wood (Michelle Monaghan) and her young son Alex (Gabriel Bateman) packing up and leaving New Mexico for Los Angeles. She joins a law firm that specializes in immigration cases, headed by Ray Hernandez (Alfred Molina). Once a true believer, he’s now more focused on the bottom line than people. Buried in a stack of files, she picks out the case of Afghan refugee Asefa Ashwari (Leem Lubany) who’s been stuck in limbo at a desert detention center. As we learn, there are stringent, sometimes arbitrary rules governing who qualifies for asylum. 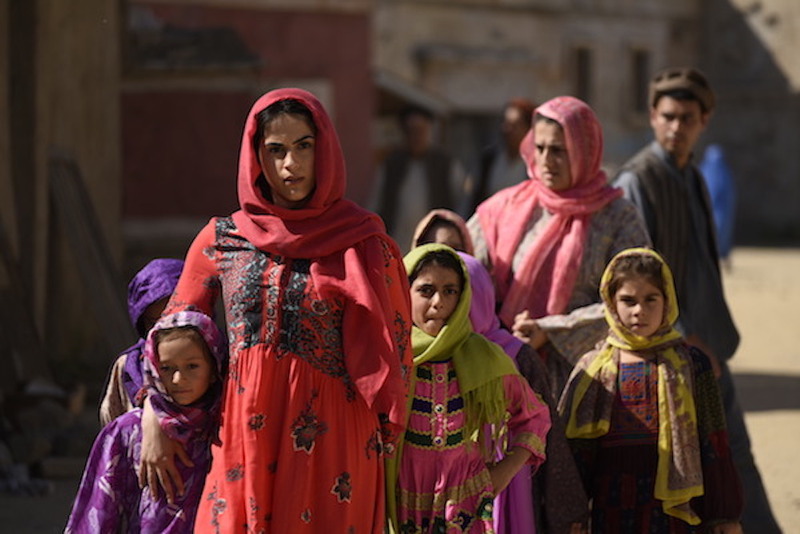 Asefa fled for her life from the Taliban but the exact reasons for her persecution are unclear and her family history further complicates her case. She’s also been keeping a secret of what happened after the Taliban jailed her. Judy meets with an over medicated Asefa. She’s shocked by Asefa’s appearance but sees a spark in her eyes. In her file, she notes that her client was a teacher in Afghanistan. Judy enlists a Muslim doctor (Mykelti Williamson) for cultural advice. Ray orders her to drop it, but she hasn’t earned her ex-husband’s (Peter Krause) nickname “Saint Judy” for nothing. It’s an even-handed, nuanced presentation which shows the U.S. Government officials as decent people working for a flawed system. Immigration Judge Benton (Alfre Woodard) presides over asylum proceedings with compassion but has to follow the law as written. Benjamin Adebayo (Common) is a surprisingly kind ICE prosecutor. Director Hanish thought it important to show the detention camp and the cramped trailers that pass for court houses where refugees meet their fate. Monaghan’s Wood is caring but tough when necessary. At the Q&A, Hanish called her “underrated” and praised her performance. We’ve written about Lubany in Omar (2013). Here, her Asefa is the heart of the movie as she regains her dignity and humanity with Wood’s help. This entry was posted in Events, Movies and tagged 2018 Los Angeles Film Festival, Alfred Molina, Common, Dmitry Portnoy, Judy Wood, Leem Lubany, Michelle Monaghan, Saint Judy, Sean Hanish by crimsonkay. Bookmark the permalink.